Following our leadership event, youth across Ontario return to their schools and communities and seek to find ways to use what they have learned at home. They bring home with them a variety of stories, leadership skills and ideas for creating change. Megan Zelle was one of those students and she was kind enough to share her story with us. “Since the summit, I have rallied allies like our city’s councillors, my school principal and some supportive community organizations who are all ready and willing to support me to turn my ideas into action. After having this experience, I am hopeful that the conversation continues to grow, and spreads all across Belleville. Unless an individual has one, knows someone who has one, or researches it themselves; they won’t know what a disability is, and how to be inclusive. We need to spark a conversation. 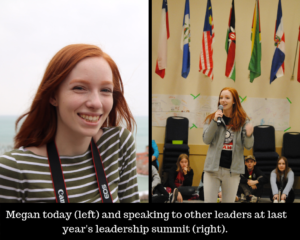 Re: Action4Inclusion will be following up with Megan and supporting her, and her team around her ideas for an inclusive leadership day at her school. Way to go Megan! Want to read more stories like Megan’s? Go to our homepage and sign up for our email updates!